UPDATED: Wed., Aug. 29, 2018, 11:01 a.m. Following a trail of legal losses dating to 2014 when he became notorious for naming a drink Date Grape Koolaid, the former owner of the Daiquiri Factory in downtown Spokane has filed a handwritten federal lawsuit against the city of Spokane from his cell in the Spokane County Jail. Jamie C. Pendleton, 45, on Aug. 21 filed the suit against everyone from Mayor David Condon down to employees who enforce parking tickets. Included as defendants in the suit are an assistant attorney general, city records clerks and the Spokane Downtown Partnership. Pendleton, who was convicted of grand theft in 2015 in Idaho relating to misuse of a credit card in an ATM machine, alleges essentially that the entire city of Spokane began conspiring against him on Feb. 4, 2016, to the present time. “The defendants in this action engaged in concert & conspiracy to drastically curtail the plaintiffs use of property by manufacturing police reports, city occupancy reports, citations and police data in 2014, to later justify the targeting and discrimination of the plaintiff in 2016 when plaintiff tried to reopen the Downtown Spokane Daiquiri Factory,” Pendleton wrote about himself in the third person. Pendleton filed the suit from his jail cell, where he has resided since he was taken into custody May 30 after he was charged with 17 counts of identity theft and forgery. Those charges relate back to his ownership of the bar. Since Pendleton pleaded guilty to the grand theft in Idaho in 2015, he was barred from owning a liquor license in Washington when he tried to reopen the bar following an eviction for failing to pay rent. After the legal donnybrook following his eviction and attempts to restart the bar with the drink’s name that sparked outrage, Spokane police investigators began to look at Pendleton’s licensing paperwork. They learned that Pendleton has an estranged daughter who lives in Texas who was given his first name but a different middle name. After the conviction in Idaho, Jamie Pendleton and his wife, Jacqueline, removed his name from the business license and added the daughter’s name without her knowledge, according to court records. 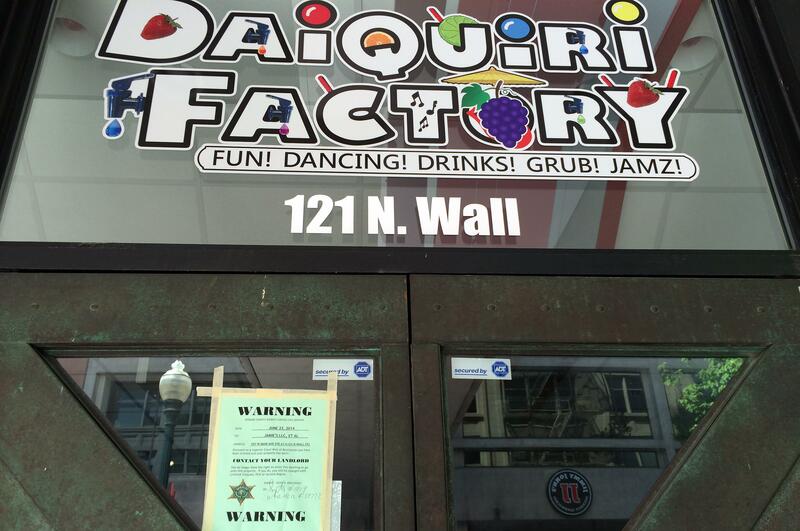 “In March of 2016 they began the application process to obtain a new liquor license for Spokane Downtown Daiquiri Factory with his name removed and his daughter’s identity added to the application,” detectives wrote. Jamie Khrystian Pendleton was born in 1993 to Jamie C. Pendleton and Zyuandria Barnes. Her parents separated when the girl was very young, and she had not communicated with her father since she was 14, according to court records. In the spring of 2016, Jamie K. Pendleton learned that her name was being used to apply for a liquor license and she contacted Spokane police Officers Michael Roberge and Stacey Carr, who both helped the daughter “with identity theft guidance,” charging documents state. Detective Carr then took over the investigation and began filing search warrants for Jamie K. Pendleton’s credit reports. Those reports found multiple bank accounts and credit cards opened in the daughter’s name without her knowledge. “Due to the huge volume of data contained in the case file and known to me about this investigation the affidavit does not contain all the facts know (sic) to me about this investigation,” one of the investigators wrote. Based on that investigation, an arrest warrant was issued on April 27, 2017. But Pendleton wasn’t booked into the Spokane County Jail until May 30. The federal suit has been assigned to U.S. District Court Judge Thomas Rice, but no hearings have been scheduled. In it, Pendleton alleges a “violation to the due process to licensing, civil conspiracy, discrimination, torturous interference with business expectancy, negligent supervision, defamation, false light and violation” of the federal public records act. Attorneys for the city have not yet responded to the suit. Published: Aug. 28, 2018, 6:06 p.m. Updated: Aug. 29, 2018, 11:01 a.m.